Using of DHTMLX UI components goes beyond the standard functionality described in docs. We’d like to share a simple way of adding a custom item in dhtmlxForm control. 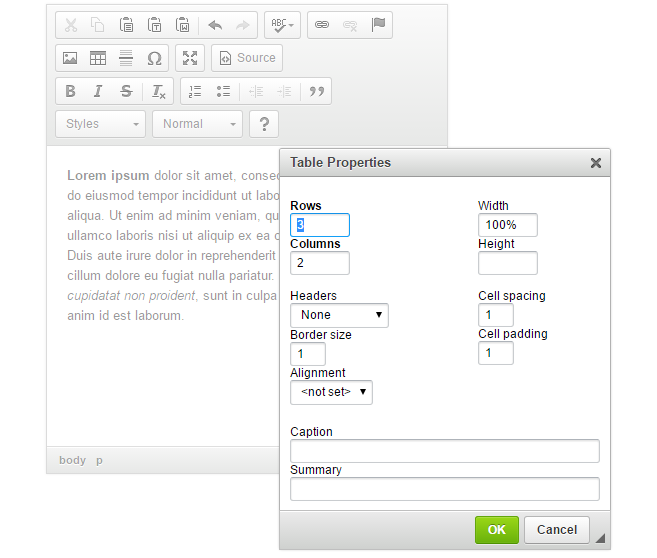 For more informative demonstration, we’ll integrate CKEditor, a popular WYSIWYG Editor, with our Form. – render is an initial item rendering method that is called 1 time. You can also specify any configuration settings here. – setValue is an internal method that sets up the value to an item at myForm.setFormData() and myForm.setItemValue() commands. In addition, we will add an event for CKEditor. It will call the onChange event of the form when the value in the editor will be changed. The onChange event will fire when the user will finish editing and move the mouse pointer out of the input. To implement the possibility of working with several editors at once, we have added the item._ckId attribute and assigned a unique value to it. All other functions will be inherited from the standard input type. Download a ready demo to check the full source code. Thank you for reading our mini-tutorial! We hope that the given instructions were useful for you. Feel free to write your questions and comments below or in the forum topic. Thank you for suggestion! I’ll pass your request to our support team. By the way, you are welcome to share your thoughts of other articles that will be useful for you.